I only discovered the two videos proposed hereunder very recently, after having been reminded that whatever you want to achieve in your life that you haven’t mastered yet, you must see and listen to what the pioneers in your field have to say. In other words, if it is the Moon you want to go to, the first thing you wanna do is listen to understand what a guy like Neil Armstrong has to say about it! Bottom line, I was overwhelmed by the disarming tears of hers when she got back to the small apartment where it all started for her. Where she suffered from extreme poverty… and, as she stressed, where she’d start from again should everything collapse for her. 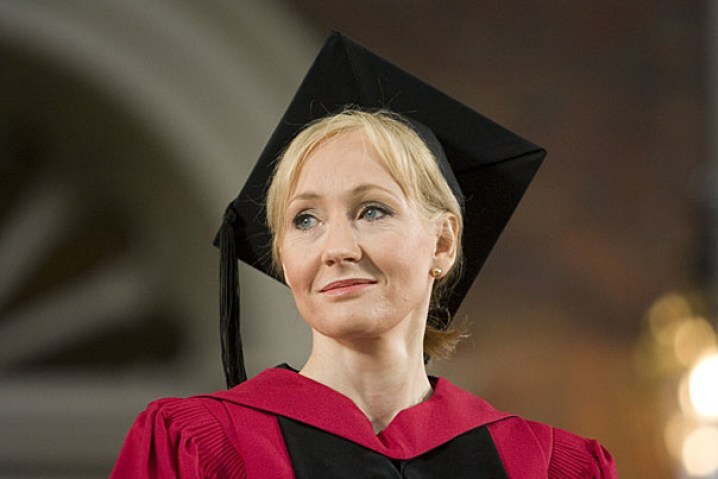 Also, I added the recording of her 2008 Harvard Commencement speech. Just like that of Steven Spielberg, which I already retrieved for you. Her words were so human, so filled with emotion and genuineness, so universal, that one can only acknowledge that there’s definitely a stature is this woman, a stature that may explain her unprecedented success. In video n°2 hereunder, you may have to skip the first 3-4 minutes introductory speech, before being able to listen to J.K. Rolwings.